News layout allows to separate news form (how articles look) and news content (text, images). Thanks to news layout in website builder WebWave you can quickly create many subpages, which will look almost exactly the same and will only differ in terms of content. In the website builder, you will see a new news layout. Edit it just like any subpage - add and remove elements, move them and change its style. 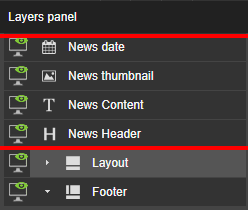 After creating news layout, you will find on it a few special elements, which enable adding news content and title, to display news date and its thumbnail. 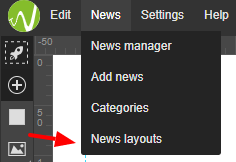 News header is a news layout element, where you can type news title. The title will be displayed on news list and will be automatically added to a news URL address. News content is a regular text element, where you can type news content and add images. A couple of first words typed in this field will be displayed as news preview. 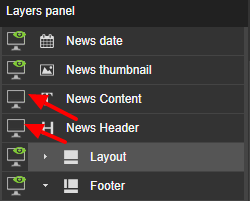 News thumbnail is an image, which is displayed on news list as a thumbnail of certain news. A thumbnail can be changed just like any other image by selecting edit content in an image corner or in the Settings panel by selecting a thumbnail. News date shows when was the news created. In news layout you set how will an article look like - the layout and style of elements. You type elements content when creating news. Elements, which can have different content in particular news, are all special elements, galleries and Facebook buttons (like it and comment). Special elements need to be in every news layout. They cannot be deleted but might be hidden. Go to layers list and hide elements by clicking on an eye icon.